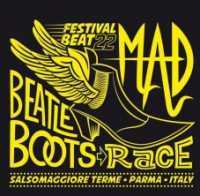 Festival Beat nel 2014 è fissato per i giorni 2-3-4-5-6 luglio a Salsomaggiore. -Una band “anomala” che ricorda a tutti come il Festival Beat non sia soltanto un paradiso per gli amanti di Nuggets con capelli a caschetto e Beatle boots. Dal gelido clima finlandese i Mutants si difendono con un suono capace di sciogliere i ghiacci. Immaginatevi Booker T. & The MG’s alle prese col rock’n’roll più sporco: chitarre a go-go ma con un’anima nera di fondo che farà ballare il popolo del Festival. Per molti, si tratterà di una piacevole sorpresa. ---An unusual band that serves as a reminder that the Festival Beat is not just a paradise for Nuggets fans sporting bob haircuts and wearing Beatle boots. The Mutants protect themselves against the freezing Finnish climate with the help of a sound that can melt ice. Imagine Booker T. & The MGs playing gutbucket rock ’n’ roll: guitars lead the way, but the group’s black music roots will soon get the Festival audience dancing. A lot of people are in for a big surprise. -E anche gli amanti della psichedelia sono accontentati: dalla Germania, i Vibravoid. Una colata di lava psych inonderà il “Cavern” del Cantuccio in una serata dai suoni lisergici e robusti che faranno la felicità di chi al garage tradizionale preferisce le lunghe cavalcate chitarristiche, le tastiere dopate e tutto ciò che vola “eight miles high”. Per loro (e non solo per loro) i Vibravoid sono una garanzia. 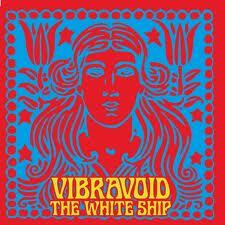 ---And we’ve got something for fans of psychedelia too: from Germany, we welcome Vibravoid. A stream of psychedelic lava will flood the Cantuccio’s “Cavern” in an evening of lysergic and hard-hitting sounds to delight those who favour long guitar-laden opuses, dreamy keyboards and all that flies “eight miles high”, as opposed to more traditional garage stylings. For these enthusiasts (but not only for them), Vibravoid are a guarantee. -Chris Rosales è una vecchia conoscenza del Festival Beat. Prima dietro i tamburi dei Get Lost poi con gli stessi Jackets aveva già calcato in passato il palcoscenico del Festival. Ma di certo garage-rock non ci si stanca mai. I Jackets sono svizzeri cresciuti a pane e Pebbles e attraversano le Alpi per dimostrarlo, ancora una volta. Per questo siamo pronti ad accoglierli e a ricambiare la loro passione. Un gradito ritorno. ---Chris Rosales is an old acquaintance of the Festival Beat. We first saw him playing drums with the Get Lost, but he’s also been to the Festival with the Jackets themselves. Well, you can never have too much of a certain brand of garage-rock. The Jackets are Swiss who’ve been raised on a diet of bread and Pebbles compilations, and they’re crossing the Alps to prove it to us once more. And we’ll be ready to welcome them and to repay their passion. A very welcome return. -Poteva mancare al Festival una band capace di rinverdire i fasti incendiari di Pretty Things, Outsiders e Tell-Tale Hearts? Certo che no! Eccovi serviti i Dukes Of Hamburg col loro R&B al calor bianco e la loro voglia di spedirvi dritti dritti con la macchina del tempo al Flamingo di Londra nel ’65 o al Cavern di Los Angeles nell’85. I Duchi di Amburgo faranno si che anche la Salsomaggiore del 2014 diventi un luogo da ricordare. ---Would the Festival be the same without a band that evokes the explosive fireworks of the Pretty Things, the Outsiders and the Tell-Tale Hearts? No way! So here are the Dukes Of Hamburg, with their white hot R&B and their desire to take you back in a time machine to London’s Flamingo in 1965 or the Cavern in Los Angeles in 1985. Thanks to the Dukes of Hamburg, you can be sure that Salsomaggiore 2014 will also live long in the memory. -Soul Soul Soul e R&B: gli Excitements terranno fede agli intenti espressi fin dal nome. Si, perché quelle che gli spagnoli spargono a piene mani dal vivo sono emozioni forti. La cantante è una giovane Tina Turner, dietro di lei una band coi fiocchi confeziona un tappeto sonoro rovente al quale è impossibile resistere. Per la durata del loro show, chiudete gli occhi e lasciate che le gambe rispondano agli ordini impartiti dagli Excitements: un torrente in piena, non provate a fermarli. ---Soul Soul Soul and R&B: the Excitements are everything their name suggests. After all, the Spanish only deal in deep emotions. The singer is a young Tina Turner, and she’s backed by a top notch band that offers a scorching wall of sound you won’t be able to resist. For the duration of their show, just close your eyes and let your legs respond to the orders sent out by the Excitements: a torrent in full flow… don’t even try to stop it. -Una delle migliori live band del momento, capaci di passare con disinvoltura dal suono dei fifties al garage e al punk-rock, veterani che suonano come ragazzini e che sul palco del Festival Beat faranno esplodere tutta la loro tracotanza rock’n’roll: sono i Peawees, Las Pezia City Rockers, gente che preserva il sacro fuoco di Chuck Berry, Count Five e Clash e che è pronta ad onorare il Festival con una performance all’altezza delle aspettative. Sappiamo che non ci deluderanno. ---One of the top live acts of the contemporary scene, quite capable of switching seamlessly from a fifties sound to garage to punk rock. These are veterans who play with the enthusiasm of kids, and they’re ready to explode the full power of their rock ‘n’ roll arrogance from the Festival Beat stage. I’m referring to the Peawees, rockers from the town of La Spezia, folks that take it upon themselves to preserve the sacred fire of Chuck Berry, the Count Five and the Clash, and who are ready to honour the Festival with a performance in keeping with their reputation. You can bet they won’t disappoint us. -Con membri di Kaisers e Thanes, gli scozzesi New Piccadillys sono una band che piacerà sia ai cultori del sixties-sound filologico che a chi vuole semplicemente divertirsi, a prescindere dal genere. Per farvi un’idea, pensate ai Ramones suonati in chiave merseybeat, con un fantastico look primissimi anni sessanta e la capacità innata di far ballare la gente. Provare per credere. ---Hailing from Scotland, and featuring members of the Kaisers and the Thanes, the New Piccadillys are a band that will delight disciples of the classic sixties sound, as well as those who are simply out to enjoy themselves without being too fussy about the genre. To give you some idea, imagine the music of the Ramones played in the Merseybeat style, together with a fantastic early sixties look and an inherent ability to get people dancing. Try it and see. -Poteva mancare il nome degli Standells, nell’albo d’oro di una manifestazione come il Festival Beat? Conosciamo tutti la risposta: no. Gli autori della celeberrima Dirty Water, colonna sonora delle “Riot on Sunset Strip” losangeline datate 1967 e protagonisti indiscussi del primo storico voume di Nuggets chiuderanno la serata del sabato sul palco dell’Area Live. Lo faranno rievocando la golden age del garage-rock forti di un repertorio vincente. E quando le casse spareranno al giusto volume Sometimes Good Guys Don’t Wear White, chiudere gli occhi e ritrovarsi nella California dei mid-sixties non sarà poi così difficile. Un’altra leggenda dà lustro al Festival Beat, una delle più grandi: dalla città degli angeli, The Standells! ---Could the hall of fame of an event like the Festival Beat possibly not include the Standells,? The only logical answer is “no”. The authors of the legendary Dirty Water, soundtrack of 1967 Los Angeles’ “Riot On Sunset Strip”, and undisputed protagonists of the very first historic volume of Nuggets, will be responsible for closing proceedings on Saturday evening at the “Area Live”. They’ll do so by evoking the golden age of garage-rock, armed with a repertoire that is a surefire winner. And when the speakers blast out Sometimes Good Guys Don’t Wear White, it’ll be a simple task to close your eyes and imagine that you’re in mid-sixties California. 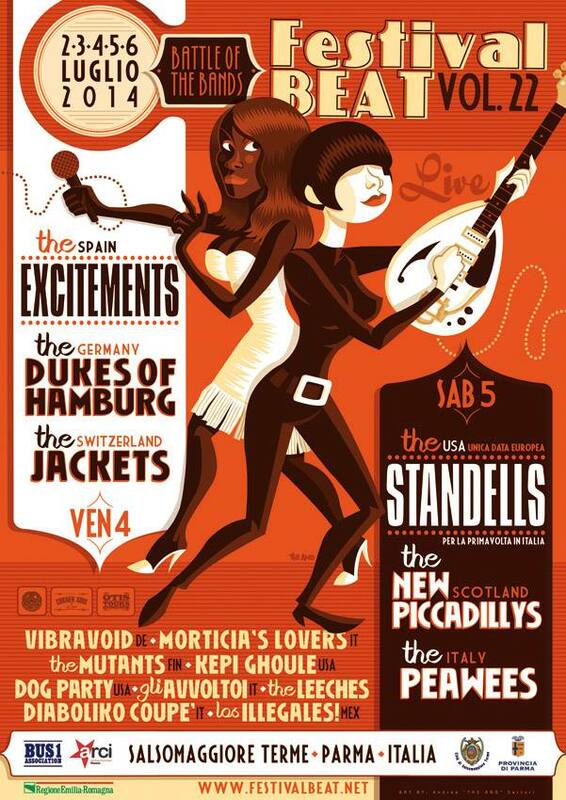 Another legend adds lustre to the Festival Beat, one of the greatest: from the City of the Angels, the Standells! -La domenica, se pensate di poter riporre le armi, sbagliate di grosso. Si, perché in quello scenario perfetto che è il nostro “Cavern” (la sala concerti dell’Hotel Cantuccio), torna in scena una piccola grande cult-band di casa nostra: i Morticia’s Lovers. Garage, punk, lo-fi anni novanta e una sana, dirompente attitudine trash per quella che si prospetta come la reunion dell’anno, degna conclusione “col botto” di un Festival Beat che più invecchia più sa estrarre gli artigli. ---Now, if you think that Sunday’s schedule means an opportunity to relax, then you’ve got another thing coming. Indeed, the perfect scenario provided by our “Cavern” (the concert hall at Hotel Cantuccio) sees the return of what is very much a cult band in Italy: Morticia’s Lovers. Garage, punk, ‘90s lo-fi and a healthy, disruptive “trash” approach, for what promises to be the reunion of the year. A worthy way to end the festival with a bang, and further proof that the Festival Beat is even more capable of showing its claws as it grows older. The current members of the band are carefully selected from a three different cities of Finland: Weijjo Abnormal (Farfisa organ, guitar), El Toro (guitar) and Jack Europa (guitar, saxophone) have been around since late nineties (applause). Also Bob Riappola´s (bass) presence since 2005 is really impressive. However, the ministry of the beat section has been quite windy. Nowadays there´s some fresh meat in the table: Juan Emperor (percussions) since 2008 and Max de Sause (batteria) since 2012.